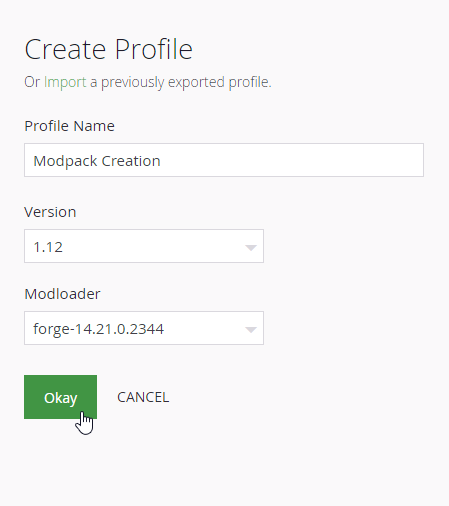 First step in creating a modpack is setting up your new profile. To do this, navigate to the Minecraft Tab in the Twitch App. From here, click the “Create Custom Profile”. You will be greeted with this page. 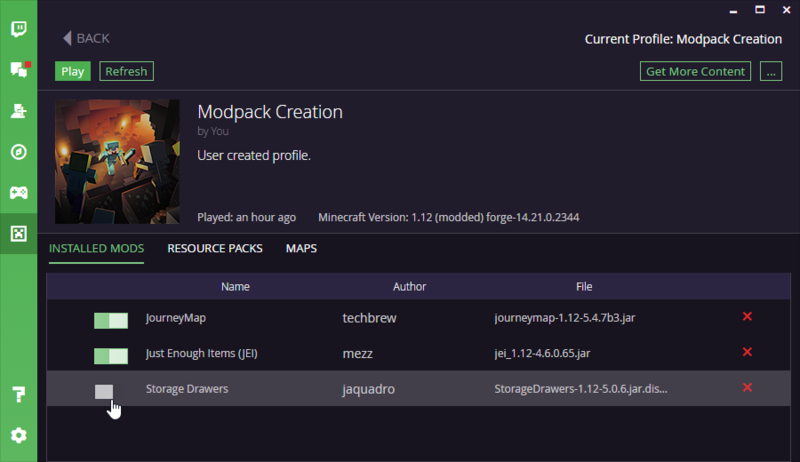 From here, you will give a name for your profile (don’t worry, this can be changed later), select the version of Minecraft, and the version of Forge that your pack will use. Once you are done, hit okay and the Twitch App will setup your profile for you. When the profile is done setting up, it will have a Play button on it. To open up your profile, just click on it anywhere aside from the Play button. 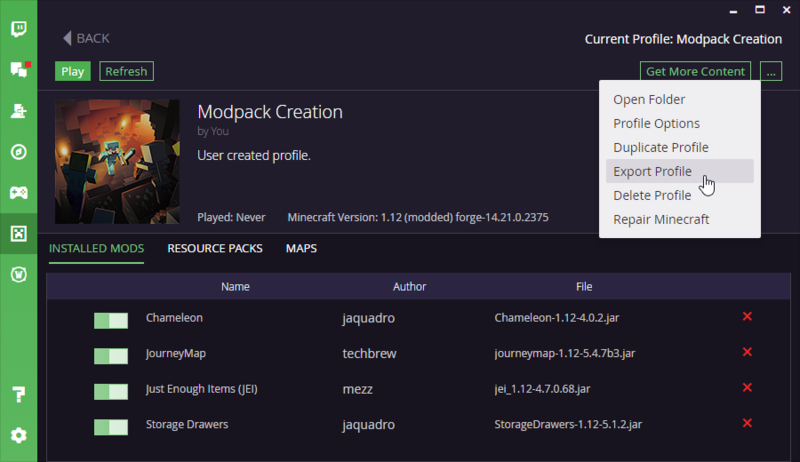 This will open up your main interface for adding content to your modpack! 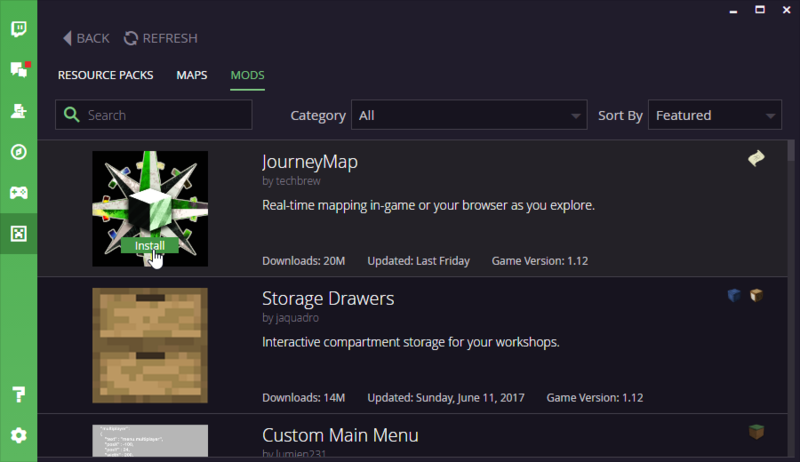 There is a tab for Mods, Resource Packs and Maps. Lets add some mods to your pack! To do this, click on the “Get Mods” button. You will be brought to a search screen that lets you look through our current catalog of mods. You are able to search by name and category. To install a mod, just hover over the picture and click the “Install” button. This will add it your your profile! You can do the same process for both Resource Packs and Maps! I installed a few mods to my profile and also disabled one of them by clicking the slider to the left of their name. Disabled mods will not be used when you launch the pack, but will stay in the profile. This can help with testing and development! You can delete a mod by clicking the red X on the right. Other options for the profile are available with the extended menu at the top right. Just click the button and you will open this menu. From here you can open the folder that this profile resides in order to do tasks like editing configs or adding approved third party mods to this profile, You can edit the profile options, and see the rest of the options available to you. Finally, you will want to test your modpack. To do so from this screen, just hit the “Play” button in the top left to launch your profile and modpack! A properly formatted modpack is a .zip file. Directly inside the .zip file is the manifest.json and a folder labeled overrides. 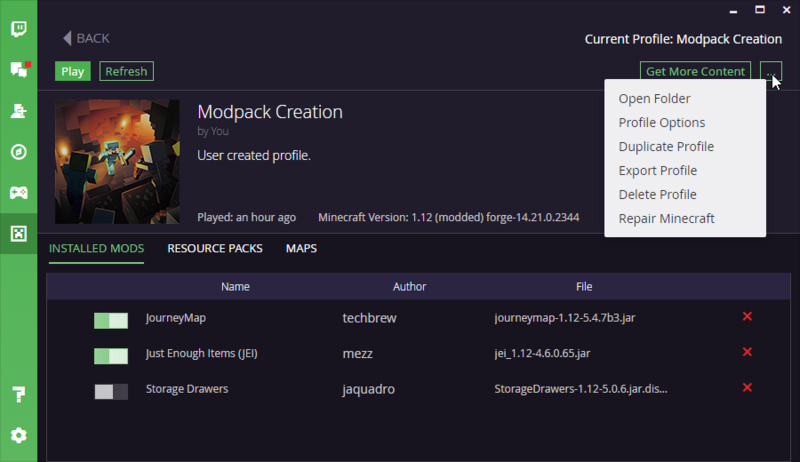 Your config folder, scripts folder, and any other folders your pack needs such as maps, saves, resources, mods etc also go inside the overrides folder. 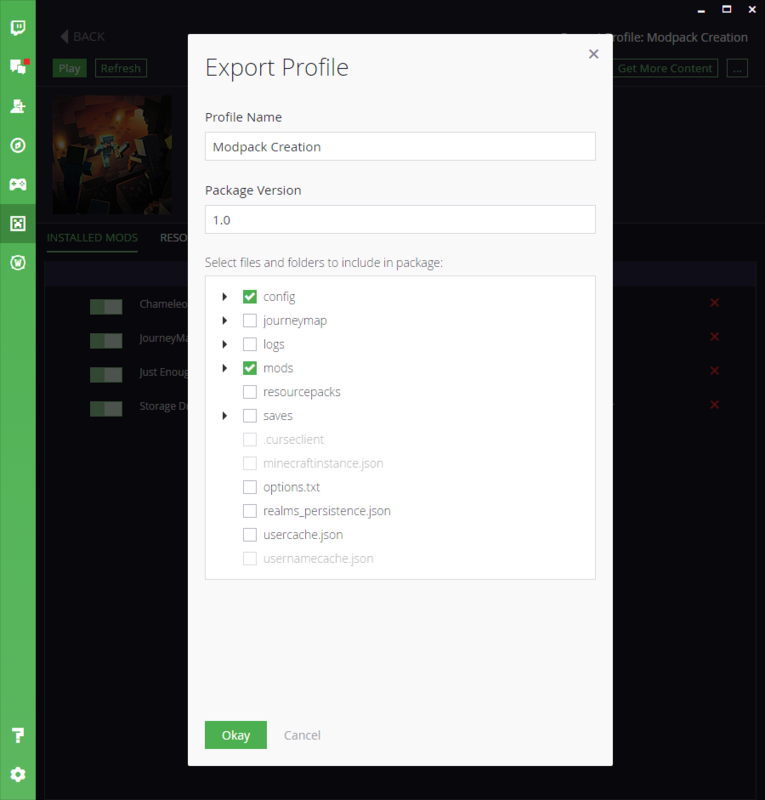 Once your project is created, you can export the pack as shown. Open up the pack you want to export, and open up the profile options. Click the Export Profile button. You will be welcomed by this screen. You can choose what is exported and what is not from here. You can add extra files such as maps or resources or saves by marking their boxes in the dropdown list. Packs with mods installed in non-traditional locations such as "/mods/1.7.10" may take longer to review. Once you have everything together you can create a modpack project. Check here for more information on creating a project. A logo with equal dimensions, at least 400x400 pixels. This must not be a blank image; your pack's name will suffice. A description that should explain the purpose of your modpack and any unique features it has. "Made for youtube" or "my favorite mods" are not proper descriptions. We believe the ideal is to have all mods in a modpack hosted on CurseForge. This allows for the best user experience and ensures authors receive credit and rewards for the blood, sweat, and tears they put into the works they have wrought. We also acknowledge that not all authors wish to upload their mods at this time, but allow for public usage. To help facilitate the transition we're going to provisionally allow certain third party mods in the overrides folder. If this proves to be a burden or issue for authors or overly taxing on our moderation staff we reserve the right to change stances on the acceptability of any specific mod or of all override mods. The mod must be licensed as MIT/GPL or an equivalent. A blurb on their webpage saying "You can use this in anything including packs" will suffice as long as there are no conditions beyond credit attached. The mod's open use policy is not conditional beyond requiring credit. Mods with "link back", "text file credit", or other requirements will not be considered. The jar must be an official unmodified distributable from the authors or a licensed and documented fork of the mod. This is not a back door for unlicensed derivative works, nor do we wish to cause undue support burdens on mod authors. Personal permissions will not be accepted. You must submit any unlisted third party mod through the list of approved Non-CurseForge mods for review. You can find a list of third party mods already approved for modpacks on the list of approved Non-CurseForge mods. 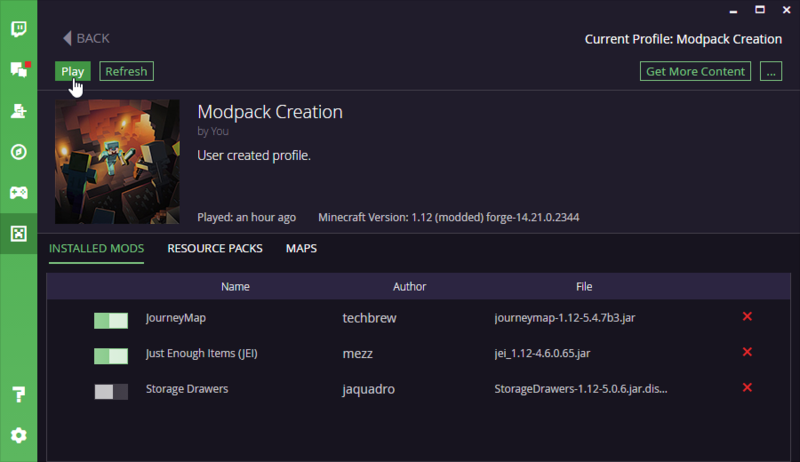 If a mod is on CurseForge you can use it in a pack on the client through the manifest.json. If a mod is on the third party list you can use it by putting it inside overrides/mods. If its not on CurseForge and not on the list, the pack will be rejected. A link to the official download site. A link to the license. Personalized permissions, a link to a text file, forum screenshots, etc will not be considered as they are easy to forge and would require too many man hours to approve individually. If the Mod Author does not have open use permissions, but would be ok with packs distributed through the client including their mod, all that is required is for the Mod Author to give permission (e.g. 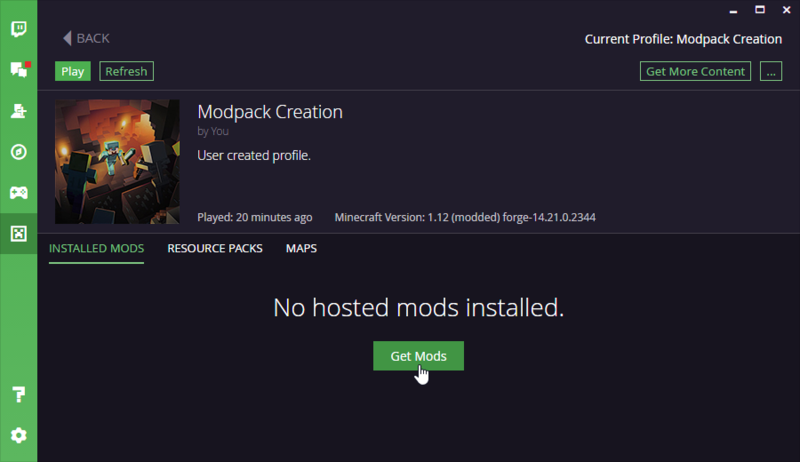 Allowed to be included in Twitch Desktop App/CurseForge Mod Packs) is all that is required. 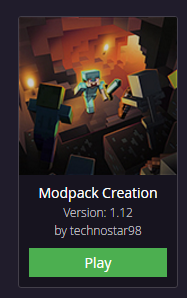 However, since people can misunderstand or misrepresent things, if a third party Mod Author feels a modpack creator is using their mod in a way their license does not permit, they can report the modpack for review. Modpacks violating mod licenses and/or the requirements we've posted will be removed from public view and given a chance to fix the issue before the pack is deleted. If a Mod Author wishes us to remove a mod from the list for any reason please just let us know. We will respect that decision in all future moderations.